Richard T Drake is the author of the Hollow World series of Epic Fantasy novels. Heir of the Hunted by Richard T Drake is a beautiful opening for the Hollow World Book series, a well-paced and attention-grabbing read for fantasy lovers. Radyn is a carnival performer, a man whose past may be as mysterious as the blades he juggles. Life could have been good for him, but the tranquillity and peace of mind he’s known all along is threatened by a magical event, one that may well become visible to ordinary eyes. The gates to the underworld are opening and the dark gods are just ready to flood the world. Now, Radyn must team up with other gifted ones to defend their world from evil. Do they have the time? Can they stand up to the power that is about to take control of the world? Readers are going to love these characters crafted with a lot of humor. I was seduced by the company of Kyna, Loken, and Grol. Apart from the compelling and complex characters, the author has created a fascinating plot, featuring creatures that will soon be classified as legendary. The setting is beautiful, a magical world where things aren't what they seem. Readers will be gripped by this story from the very first page and the author has the knack for creating suspense. The action builds up with the conflict and attains staggering proportions. Heir of the Hunted by Richard T Drake is a book that will wow readers and make them dream of dark gods, demi-gods, and unusual heroes. It’s very entertaining. Sizzling with a supernatural feel. Heir of the Hunted: Hollow World Book 1 by Richard T Drake initially attracted me because of its cover, which had a haunting melancholic purple colored background of orbiting moons, an amazing sky littered with myriad stars and a sword wielding warrior on rocky ground, facing an unknown adversary. A quick look inside had me thanking Readers Favorite for letting me review it. The chief protagonist of this fabulous adventure is a young man, Radyn Viscere, traveling with his foster father, Uric, in a band of traders in a far away land named Oberyon. Wandering into the forest to empty his bladder one night, Radyn reaches a lake. Suddenly a great object emitting light hurtles down from the sky; it stops, hovers over the lake, then flies away at great speed. Overcome by some uncontrollable desire, Radyn runs after the fiery object, but is unable to catch up. Much later he finds himself on one of the wagons of the caravan, not knowing how! This was the beginning of an incredible sequence of events leading Radyn into wondrous places, great battles, and fantastic scenes of bravery and magical events, leaving him wondering who he is? And much later, who is Maelkevar and where is his ancient citadel of Mekaezra? The descriptive prowess and the fertile imagination of the author are evident not only in the fantastic story line, but in the fantastic people and creatures like Baergin’s muscled mercenaries, the twins from Zahedia, Kip and Peke, Dace Majellan, Skyg the grodgolyte, an insectoid Syrentian noble, Onn the bacyan, Brolda, the aged seer, Trelis, Ledala the acrobat, and the second main protagonist a young girl, Kyna Vuegaard. Myriad scenarios merge smoothly into the other, threads weave seamlessly, formatting is excellent, and timelines are fluid. 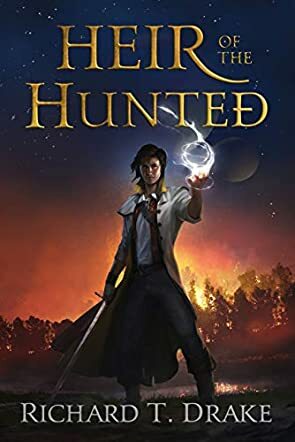 Heir of the Hunted is a book I recommend for its great mastery of fantasy, a worthy addition to any library where people with fertile imagination wander. Radyn, our hero, never knew his father, and lost his birth mother at a young age. He and his mother had been invited to live with Uric, a stern foster father who runs a small traveling circus, and Orel, Uric's kind-hearted merchant wife. Radyn is raised to be an acrobat and juggler in the circus, traveling under the watchful eye of Uric. Radyn's birth is a mystery and, while great and strange things have been predicted for him, there was nothing in the young man's childhood to prove that to be true. He was an ordinary performer, getting into trouble as young men typically do, usually in the company of his best friend, Cune, who later became a soldier, and his pet burveeg, Grol. One day, Radyn realizes that he's lost half a day of time and that sometimes time slows to a crawl, but only for him. About then, he finds out that he is the target of a cabal called the Kah, dedicated to magic and evil-doing. Radyn needs to discover why him? Separately, we meet Kyna, a young warrior, who decides that it's her job to save the planet from the Kah and from another strong, overpowering race called theeds. Eventually, the paths of Radyn and Kyna converge. Richard T. Drake has done a commendable job of presenting his readers with an amazing and dangerous fantasy world, The Hollow World, launched with this first volume in the series, Heir of the Hunted. It's truly wonderful when a great idea and excellent writing skills meet, and this is certainly the case here. The author also does a smooth job of presenting an entire story and then setting readers up for the next book in the series. Heir of the Hunted is well-paced, with enough dialog, but not too much, and a cast of interesting characters, among which are Loken, a half-god whose father hates him, and Dace, publicly a famous bard, but secretly a master of the Alakytes and a mentor to both Radyn and Kyna. Any lover of fantasy will find this new series entertaining. Intelligently imagined and masterfully crafted, Heir of the Hunted by Richard T Drake is a good beginning for a fantasy series that will delight readers keen on exploring themes like the eternal battle between light and darkness, goodness and evil. What makes it an endearing read is the fact that the author doesn’t come across with the clichés that are common in this genre. The passage to the underworld is opening and its darkness could begin to flow into the light of this world; the demons are loose and ready to wreak havoc. A man with a mysterious path must answer the call to fight the darkness. Together with a warrior, a demi-god, and other heroes, Radyn is set to embrace his destiny, but how much time does he have before the darkness consumes his world? I fell in love with Radyn and loved the way the author masks his gifts. He appears to be just a mere carnival performer, but beneath that façade is a powerful personality and magical gifts that will come to readers as a huge surprise. There couldn’t have been a better way to begin the Hollow World series than with Heir of the Hunted, a work with a very beautiful setting and an intricate plot. One gets the feeling that something evil could happen any time and it’s hard to imagine what it could be. Richard T Drake’s writing is excellent and his ability to create breathtaking images can’t go unnoticed. The characters are lovable, even memorable, and readers will enjoy following them. This is a very promising series, with a huge potential to entertain fans of fantasy. In Heir of the Hunted (Book One of the Hollow World) by Richard T. Drake, the primordial barrier to the underworld, the Saelydion, is failing. Dark beings are beginning to roam and conquer the surface again. It’s only a matter of time until the barrier fails completely. Hope rests on the mortals to defend their own and a group of unlikely alliances: Radyn Viscere, a young carnival performer with a hidden past and his trusted beast, Grol the burveeg, a spiritual Alakyte warrior named Kyna Vuegaard, who’s on her very first mission, and Loken, a surly demigod cast out by his father. The story starts slowly but with detailed narrative about the world building and the characters, which are diverse with numerous different races and beings. Some early actions in between, particularly with the female warrior Kyna’s adrenaline pumping feat battling the theeds in the ruins of a lost city, make the plot pace faster. I gravitated more towards her part in the story, as the young Alakyte initiate was torn between keeping to her task ordered by her masters, or following her intuition and doing what is necessary against the impending doom. The mysterious past of another protagonist, Radyn, also kept me intrigued as the plot gradually gained momentum. There's a subtle Greek myth influence regarding the gods in Drake’s created world and, together with the detailed fight scenes, they add more depth to the plot. All in all, Heir of the Hunted is a solid debut for the Hollow World series, having all the requisite points for an epic fantasy novel.